Great mountain biking trails. Big game viewing. 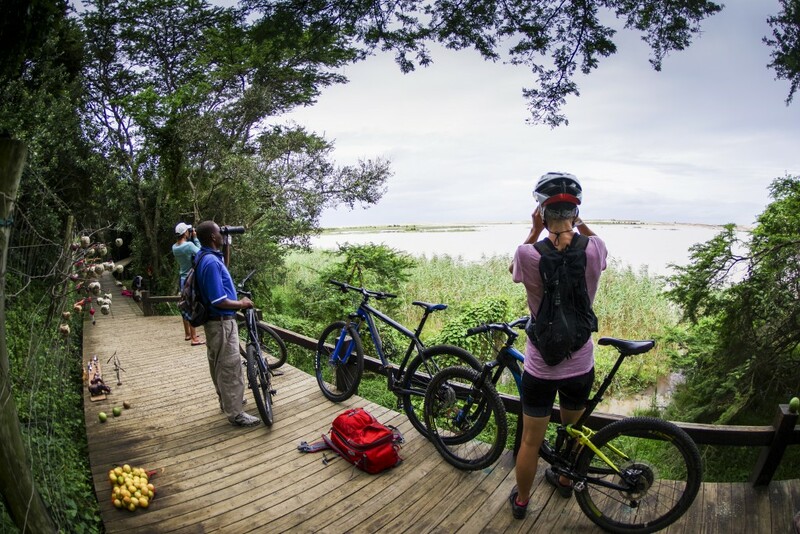 Nine months of summer every year … you can do worse than saddling up your MTB in iSimangaliso, northern KZN’s ‘Place of Miracles and Wonders’. iSimangaliso rates as the largest natural World Heritage Site on the planet, stretching 230km from north to south, and encapsulating an astounding 8% of South Africa’s total coastline. This spectacular wilderness area encompasses half a dozen unique eco-systems, making it one of South Africa’s most diverse nature regions. Although most of this Wetland Park is the domain of pretty dangerous creatures, visitors still have a number of trail options open to solo riding. It is however extremely important to always check with park management, as especially hippos, crocs, python and also leopard are sometimes spotted, even in the nearby St Lucia village. Your best bet for a solo ride is the ‘Game Park’ section of iSimangaliso, just adjacent to the Bhangazi Entrance Gate. It is easy to reach from town and safe to boot, with a 99.9% chance you won’t bump into any bad-tempered beasties. Some tracks may be sandy here and there, but it’s an excellent spot for an hour or two of cranking. The Game Park Section traverses the Eastern Shores section of iSimangaliso, just north of St Lucia village. A mix of grassland and dense sand forest stretches from town to a fence demarcating the ‘Game Park’ area, and makes for an easy pedal from the urban edge. All in all, you get forest singletrack, some wooden boardwalk sections near the estuary, a few footpath loops, gravel road and connecting tarmac to make it a worthwhile 25km crank. Start off with the Igwalagwala Trail, right from main road (Mckenzie Street) and follow it to the trail head at the final traffic circle. You’re now at the start of Igwalagwala Trail, an easy 2km crank via indigenous woodland. Take your time and revel in the deep-forest sounds of an incredible 526 species of birds found here, while looking out for shy duiker, mongoose, python and other small game. You can also access Igwalagwala Trail from the Ski Boat Club. At the end of the tar road, follow the estuary boardwalk next to Sugar Loaf Camp site for 500m through the dappled shade of dense stands of mangrove trees on the water’s edge (look out for hippos, crocs and an abundance of water birds). At the end of the boardwalk, continue left via a parking area surrounded by sand dunes and onto a quiet tarmac road which stretches past the St Lucia beach front and to the Main Beach. To get to the ‘Iphiva Trail’ section, turn left onto Beach Road for 1km and look out for a small servitude on the right-hand side. Ignore the ‘No Entry’ sign and follow a concrete dual-track through tall grass, turning left after 100m into an open grassland area. You are now at the Iphiva trailhead; continue in a northerly direction, crossing a grassy dune to meander into one of many indigenous forest sections. There’s something truly special about this specific glade, as it is home to one of the park’s resident (but very shy) leopards. A scenic 2km crank eventually T-bones onto Iphiva Road. Cross straight over and into the Game Park section, where some super singletrack awaits. An abundance of plains game – including zebra, waterbuck, blue wildebeest, impala and warthog – await along just on 3.7km of game footpaths. Remember, animals always have right of way. Once you reach the tarmac road, continue along the clearly visible trail to the lakeside of the Game Park section. A mini-savanna awaits, with the route winding amidst grassy sand dunes dotted by verdant Umdoni (water-berry) trees. A junction after around 850m brings you to a fence and style. Stay out of the ‘dangerous game’ section by turning left and choose one of two options: an immediate right will follow the edge of a water pan, with a chance of zebra and waterbuck. Option #2 traverse more indigenous forest, with a wooden bridge crossing a fern-fringed wetland. From here, crank onto an open path parallel to the fence line, with views of Lake St Lucia Estuary itself, a distance of approximately 2.8km. Both these options will eventually get you to the Croc Centre near Bhangazi Gate, a safe and convenient parking spot if you should do the trail in reverse. Please note, even though you may be outside the ‘Dangerous Game’ section, both hippos and crocs frequent the estuary, so always be aware. A three hour drive from Durban will get you to St Lucia, a perfect launch pad into iSimangaliso Wetland Park. Follow the N2 north, then turn east on the R618 via Mtubatuba for 30km.